Love this holster. My .380 fits perfect and it is so comfortable. Super strong magnet keeps it in place. Okay I love this holster, as a retired leo I have used easy to many holsters. I have always used galco and desantis holsters. But I have found my new favorite. Awesome fit and feel, great quality and having the magnet retention and easy off not having to feed thru my belt. Amazing speed off and on. Pull it out or put it back in your pants without a hassle. getting ready to order another. I was so pleased with this product that I ordered one for my wife to use for her gun. Ladies especially, but applies to men also, please take this to heart! My experience! I refuse to carry my handgun in a cc purse where it is more likely I would have less control over it. I was at a store a couple of weeks ago and went to use the restroom. Using a different brand holster I had to be very focused on not forgetting my handgun, so focused that I forgot my keys in the restroom! 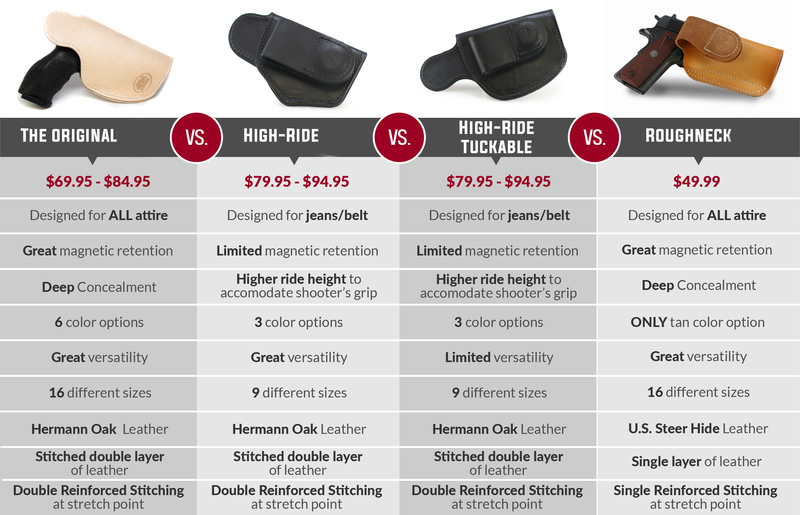 I could not afford the original magnetic holster (sigh), but I could afford the roughneck with a coupon! There is now a ZERO chance that I will ever forget my handgun because it is now on the stall door right in front of my face!!! I feel relaxed and at peace now when I cc! How would I be able to draw smoothly when the magnet is strong enough to hold the gun even upside down? How firmly could magnets hold it on my pants? How comfortable could they possibly be? But, these products have far exceeded my expectations and needs. I will be adding additional sizes for my other guns soon! Have had my holster for about a week. I have gone thru about 5 holsters since I started carrying won't need anymore except to purchase a medium roughneck for my 9 mm best holster ever. everything in infomercial is all true. I've previously purchased a JM4 Tactical Holster for my Sig Sauer P320 and it quickly became my EDC once the leather was broken in. After purchasing a P238 i had to look no further than to trusty JM$ Tactical to carry my new pistol. Once again, I'm blown away at the retain-ability of the rare earth magnet used by JM4. Whether I'm wearing gym shorts, jeans, or pressed slacks. I carry confidently with my JM4 Tactical holsters. Light weight and very comfortable to wear. Easy on/off. Very pleased! !